Next time you go to the store, remember to Bring Your Own Bug...uh, Bag....uh, both! 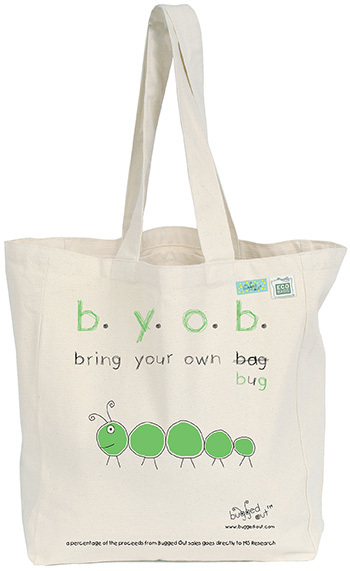 Check out all our adorable BUG bags and bring a whole fleet with you on your next shopping trip! These totes are made from 100% recycled cotton canvas. All seams and stress points are double stitched for durability. They are handprinted in NY and a percentage of the proceeds goes to Multiple Sclerosis Research! Care Instructions: Machine wash inside-out in cold water with gentle soap, hang dry. This item ships from a separate warehouse in 3 days. This item is not available for international (non U.S.) shipping.